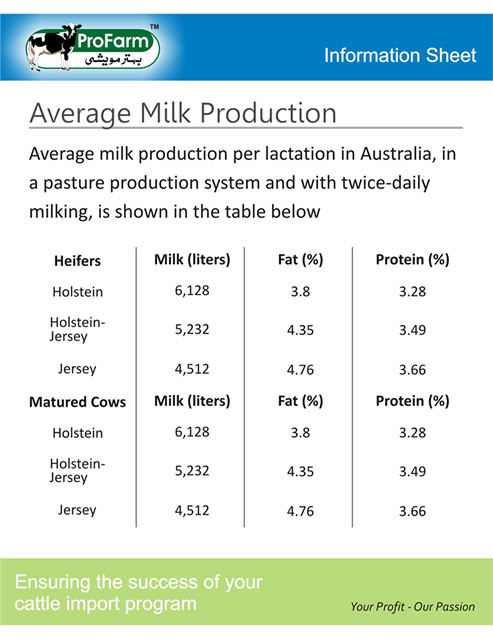 Making the right choice of animals determines the future potential of your dairy. You have many different options to choose from: local Sahiwal or local crossed animals, imported Jerseys, Holstein Friesians or Crosses of Jersey and Friesians. Every breed has its distinct advantages and disadvantages. Together with you we will explore what is the most suitable choice for your specific plans and your determined budget. Call or mail us to make an appointment. 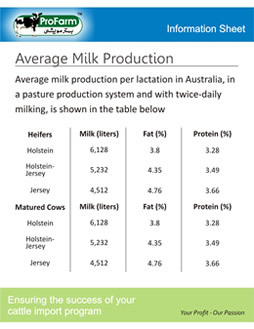 For the import of prime dairy cattle we work with a consortium of Wellard Rural Exports and Atlas Exports from Australia. Wellard Rural Exports is one of the largest exporters of cattle in the world. They own and operate the largest cattle ships, which will ensure flexible, smooth and fast shipping. Atlas Exports has an over 20 years excellent track record of export of dairy cattle to countries like Mexico, Oman, Saudi, Kuwait and Pakistan. Wellard/Atlas has supplied all the cattle for At Tahur Farm in Pakistan. Good selection of the best cattle is the foundation of a successful start of your farm. Through our wide network of buyers we will help you to select the best heifers available. We will also facilitate your visit to Australia to select or inspect the heifers, so that you have first hand assurance of quality. Smooth and fast shipping will ensure that the heifers will reach Karachi port in a healthier and better body condition. Wellard owns and operates the largest and most advanced cattle ships in Australia. These ships are purpose-built and they are equipped with technology to ensure smooth and fast shipping even in extremely bad weather. This will ensure minimum impact of shipping on the heifers. Thus your heifers will arrive in a better condition. The onward transport of your heifers from Karachi to your farm should be fast and smooth, to ensure minimum impact of the journey and the weather conditions on the animals. Together with you, we will plan and execute every aspect of the transport to your farm. Our commitment to you goes beyond supplying you with the best heifers. Through our technical team we will help to ensure the smooth arrival and quickest acclimatization of the heifers. We will be with you to help you get started and to get the results from your herd. Do you want to start or expand your dairy with the best Dairy Cattle? Call or write us for an appointment.